A few libertarian-friendly economists are sympathetic to a carbon tax, at least with major caveats. In response to the recent defeat of Washington State’s carbon tax, several of these economists have been chiming in, with a combination of acknowledging the political realities while still concluding that, at least in theory, a properly implemented carbon tax would be a sensible policy. When you throw in the standard Public Choice concerns over real-world flaws in the political process, the standard economist’s case for a carbon tax collapses. For the reader who wants to survey some of the recent commentary, I have in mind a Bloomberg article by Tyler Cowen, and the ensuing responses from Scott Sumner and John Cochrane. All three are economists who generally favor market approaches to problems, and are typically quite skeptical of government “solutions.” Yet these three are sympathetic to a carbon tax, at least as long as it is revenue neutral. However, this seemingly sensible approach of “tax ‘bads,’ not goods” overlooks other standard results in the public finance literature. Let’s put aside the issue of climate change for a moment, and just think about conventional tax design. It’s pretty standard in this literature for economists to recommend raising revenue in ways that disrupt the economy as little as possible, seeking to minimize what economists call “deadweight loss.” In particular, deadweight loss occurs when parties refrain from engaging in mutually beneficial activities because of a tax. This causes a “deadweight loss” because the two parties lose out on the potential benefits, and the government doesn’t see any of the revenue from an activity that doesn’t occur. One of the standard principles in optimal tax design is to have as broad a base as possible, so that the marginal rate of the tax can be kept as low as possible, for a given target revenue. For example, if the government is going to raise a billion dollars from taxing automobile sales, it would be better to levy the tax on all autos sold, rather than trying to place the tax just on red cars sold. Besides the issue of fairness, what the cold-blooded economist would say is that a tax placed just on red cars would need to have a higher rate—in order to raise the billion dollar target—and because of that, the tax would cause a bigger drop in car sales. People would switch out of red cars and into other colors. There would be a much bigger distortion in economic activity from a billion dollar tax on red cars rather than a more broadly levied tax on all cars. Try a different example: Imagine if the IRS, rather than applying the federal income tax to all workers, instead only applied the code to workers who were between the ages of 30 and 50. And furthermore, the government bumped up the marginal tax rates, in order to squeeze the same amount of total revenue out of workers in their 30s and 40s, as they currently derive from the entire workforce. Again, besides basic issues of fairness, such an approach would be grossly inefficient, because it would give a huge incentive for workers to rearrange their activities, sucking as much income “forward” into their late 20s and pushing it “backward” to when they were 51 or older. With marginal tax rates of (say) 85 percent for people in their mid-years, lots of skilled workers would put forth less effort at age 48 (say) because of the punitive tax. Society would thus lose out on their productive work, and the IRS would have nothing to show for it, either, since you can’t tax income that isn’t generated in the first place. Now that I’ve warmed the reader up, consider a third example: Suppose instead of raising $100 billion annually through an income tax, the government instead tries to raise that same amount of revenue each year by taxing the carbon content of economic activities. This too would have an immediate impact on behavior, causing people to rearrange their affairs in order to minimize their exposure to the punitive new tax. Because the “tax base” of carbon-intensive activities is smaller than the base of “activities generating income,” in this respect a carbon tax is obviously more economically disruptive than a conventional income tax. Now it’s true that with a carbon tax—unlike a tax on red cars or workers between the ages of 30 and 50—there is a separate issue which may yield external social benefits from the tax swap. However, the basic economic logic of tax bases still remains, and at best one would have to argue that the benefits from reduced climate change damage offset the economic losses. Yet when Sumner writes, “Even if global warming is not a problem, there are obviously much worse taxes than a carbon tax,” he sure sounds like he’s saying we can throw out the climate change issue altogether. Perhaps Sumner merely meant that we can be agnostic about the magnitude of the social cost of human-induced climate change. But again, let’s try that logic in a different context. Would it make sense to cut federal income taxes by $100 billion, and replace them with a $100 billion tax on cigarettes purchased only in the state of Florida? Even if we think smoking is a bad thing and should be discouraged through taxes, I imagine most readers would agree that my hypothetical policy would make little sense. Beyond the problem of deadweight loss, it wouldn’t be very effective in reducing lung cancer, because so many Floridians near the border would simply cross over into neighboring states to buy cigarettes at the original price. And thus we’d have the worst of both worlds, emanating from my hypothetical tax on Florida-only cigarettes: To raise the target amount of revenue, the per-pack tax would have to be enormous, leading Floridian smokers to alter their behavior in costly ways that don’t translate into extra revenue for the government. And yet, much of the rearrangement in their activities would be to buy cigarettes from neighboring states (or via the black market), so that the punitive tax wouldn’t even achieve as much of the health benefits as proponents might have supposed. Now turning from the hypothetical smoking analogy back to the climate change policy debate: Even if one thinks that carbon emissions are a bad thing and should be discouraged through taxation, an overly aggressive carbon tax would cause much more conventional economic damage than a broad-based income tax, and if levied at the U.S. federal level (rather than globally), would induce other countries to increase their carbon emissions. Therefore, an aggressive U.S. carbon tax would hamper American economic growth while suffering from “leakage” in the fight against global emissions. Readers may have followed the general logic of my arguments above, but wonder if quantitatively my concerns have any merit. Yes, they do. The standard modeling in this literature shows that only corporate income taxes—not just general “income taxes” as Sumner seemed to believe—are more destructive than a carbon tax. In particular, even if one implemented a carbon tax and used the revenue to reduce personal income taxes dollar-for-dollar, conventional GDP growth would still suffer. To fully understand this result, you need to read up on the “tax interaction effect.” My full discussion is in this article, but here’s the quick intuition: Taxes on labor and saving are harmful because they reduce the reward to workers and investors. Even if a carbon tax is used to reduce the rate of those distortionary taxes, because the carbon tax raises prices, it exacerbates the harm of the residual of those distortionary taxes. For example, a worker doesn’t earn the full marginal product of his labor because the income tax siphons some off the top, but then when he goes to buy gasoline, the carbon tax hits him again, reducing the effect “real purchasing power” of his paycheck. So the worker has even less incentive to sell his hours for money. As the chart shows, only a corporate income tax swap actually boosts economic growth. Notice also that a “rebate” approach—in which all carbon receipts are returned lump-sum to citizens—leads to an economy that is perpetually 3.5 percent below where it otherwise would be. 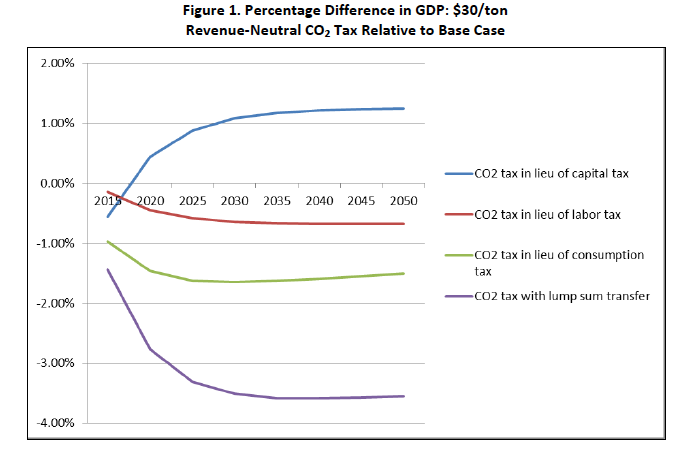 Finally, I want to stress that RFF supports carbon taxes—the above chart is coming from fans of the approach. A few otherwise market-friendly economists have a soft spot for a carbon tax, at least if it comes with assurances of revenue neutrality. They tell their readers that such a tax swap would boost economic growth, and it would be good for the environment as a bonus. Yes, it sounds very intuitive to “tax ‘bads,’ not goods,” but it’s also a standard rule of public finance to “keep the tax base as large as possible.” By trying to raise revenue from a portion of the economy—and one that is integral to electricity, heating, and transportation—a carbon tax actually violates standard precepts of tax design. That is why standard modeling shows that even revenue-neutral carbon taxes would slow economic growth, except in the politically implausible scenario where virtually all the revenue were devoted to reducing corporate income taxes.